Fitness for Life is a comprehensive fitness education program that helps students take responsibility for their own activity, fitness, and health. Through Fitness for Life, students are prepared to be physically active and healthy throughout their adult lives. This evidence-based and standards-based program follows a pedagogically sound scope and sequence to enhance student learning and progress. In addition, the authors went through an exhaustive process in revising and updating all the chapters to reflect current research and the new national physical education standards and fitness education standards. The entire book has been reorganized and completely rewritten. - Meet the national, state, and local grade-level standards and outcomes developed for K-12 physical education by SHAPE America based on the new standards outlined in Healthy People 2020 and published in 2014. - Learn the values and benefits of lifelong physical activity through the HELP philosophy, which specifies the goal of promoting health for everyone with an emphasis on lifetime activity designed to meet personal needs. - Become informed consumers on matters related to lifelong physical activity and fitness. - Learn sellf-management skills that lead to adopting healthy lifestyles. - Recognize and overcome the barriers to reaching activity and fitness goals. - Use technology to promote healthy living. - Separate fitness facts from fiction. - Take personal responsibility for program planning and setting individualized goals. This best-selling text, written by internationally renowned authors and educators Charles B. Corbin and Guy C. Le Masurier and contributing author and educator Karen McConnell, is suited for use in a general physical education or personal fitness class. It will help students meet national and state physical education standards--not only those focused on health-related fitness and physical activity but also those related to movement skills and concepts, diversity, and social responsibility. Fitness for Life can be modified to fit any schedule, including block and accelerated block. It can be taught as semester-long, yearlong, or multiyear courses. The HELP philosophy on which the book is based (health for everyone with an emphasis on lifetime activity designed to meet personal needs) teaches the value of lifelong physical activity as well as the idea that physical activity can and should be fun. The authors use the Stairway to Lifetime Fitness concept to show the importance of learning decision-making and problem-solving skills that enable students to develop their own health-related fitness programs and maintain a physically active lifestyle into adulthood. 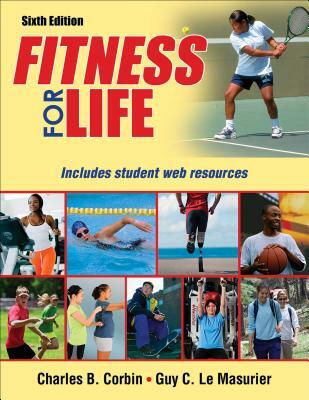 Every chapter of Fitness for Life, Sixth Edition, includes self-assessments for the students to perform--including Fitnessgram assessments--and lessons on self-management skills such as reducing risk factors, resolving conflicts, setting goals, managing time, and overcoming barriers to success. The book devotes multiple lessons to personal program planning, implementation, and evaluation. - Lesson objectives direct student learning. - Lesson vocabulary helps students understand multiple uses of words (definitions in glossary and online). - New art includes a version of the physical activity pyramid for teens. - New photos and design give the chapters a refreshing student-friendly look with its dynamic four-color design. - Muscle art identifies the muscles used in each exercise. - Fit Facts give quick information about relevant topics. - Quotes from famous people reveal their thoughts on fitness, health, and wellness. - Fitness Technology offers opportunities for students to use or study technology. - Science in Action provides in-depth coverage of innovations in fitness, health, and wellness. - Self-Assessment allows students to evaluate their fitness, health, and wellness as the first step in personal planning for improvement. All of the self-assessments in Fitnessgram are included. - Taking Charge and Self-Management allow students to learn self-management skills for adopting healthy behaviors and interacting with other students too solve problems encountered by hypothetical teens. - Taking Action features activities that are supported by the lesson plans. - Consumer Corner is a once-per-unit feature that helps students become good consumers of information on fitness, health, and wellness as they learn how to separate fact from fiction. Fitness for Life offers students and teachers an array of supporting materials at www.FitnessForLife.org. In addition, Fitness for Life, Sixth Edition, is available in digital as well as print formats. Students and teachers can use e-books in a variety of platforms, in combination with the student and teacher web resources, to interact with the material. In addition, iBooks are available for students and teachers in an interactive iPad version. Dr. Charles B. ("Chuck") Corbin, PhD, is professor emeritus in the School of Nutrition and Health Promotion at Arizona State University. He has published more than 200 journal articles and has authored or coauthored more than 90 books, including Concepts of Physical Fitness, Concepts of Fitness and Wellness, Fitness for Life, and Fitness for Life: Middle School and Fitness for Life: Elementary School, all winners of Texty Awards. Dr. Corbin is internationally recognized as an expert in physical activity, health, and wellness promotion and youth physical fitness. He has presented keynote addresses at more than 40 state AHPERD conventions, made major addresses in more than 15 countries, and presented numerous named lectures. He is a past president and emeritus fellow of the National Academy of Kinesiology, a fellow of the North American Society for Health Physical Education Recreation and Dance Professionals, an ACSM fellow, and a life member and honor fellow of AAHPERD. His awards include the Healthy American Fitness Leaders Award from the President's Council on Fitness, Sports, and Nutrition (PCFSN) and National Jaycees; Distinguished Service Award of the PCFSN; and the Honor Award, Physical Fitness Council Honor Award, Hanson Award, and Alliance Scholar Award from AAHPERD. He received distinguished alumnus awards from the University of New Mexico and the University of Illinois. He served for more than 20 years as a member of the Advisory Board of Fitnessgram and was the first chair of the Science Board of the PCFSN. He was a member of an Institute on Medicine (IOM) committee for youth fitness testing. He was selected to the National Association of Sports and Physical Education (NASPE) Hall of Fame. In 2009 Dr. Corbin was chosen for the Gulick Award, the highest award of AAHPERD. In 2013 he received the Hetherington Award, the highest honor of the National Academy of Kinesiology. Guy C. Le Masurier, PhD, is a professor of sport, health, and physical education at Vancouver Island University (Nanaimo, British Columbia, Canada). He has published numerous articles related to youth physical activity and physical education and coauthored the National Association for Sport and Physical Education (NASPE) Physical Activity Guidelines for Children. Dr. Le Masurier has given more than 30 research and professional presentations at national and regional meetings. He reviews research for numerous professional journals and has contributed to Fitness for Life, Fifth Edition, and the Physical Best Activity Guide. Dr. Le Masurier is a member of AAHPERD, NASPE, ACSM, and Canadian AHPERD. He is also a research consortium fellow of SHAPE America. Contributing author: Karen E. McConnell, PhD, a professor at Pacific Lutheran University, is a certified health education specialist (CHES) and has taught at the university level for more than 15 years in areas related to health and fitness education, curriculum and assessment, and exercise science. She has written or contributed to over a dozen book chapters and texts, including the teacher resources for Fitness for Life (fifth and sixth editions). She is a recipient of the Arthur Broten Young Scholar Award and has received the University Professional of the Year Award from the Washington Alliance for Health, Physical Education, Recreation and Dance for contributions made to state standards in health and fitness. She enjoys running, having commpleted 38 half marathons and one marathon. As a resident of the Pacific Northwest, she enjoys participating in most outdoor activities.